The first of the Rogues to Riches novels is a romance to behold. In My One and Only Duke, Grace Burrowes pairs two of the most unlikeliest people to marry and right the wrongs suffered by an innocent man. Quinn Wentworth made his fortune as a banker, but as fate would have it, he ends up in Newgate waiting to be executed for a crime he did not commit. Then fate makes another move in the form of Jane Winston. The widowed, soon-to-be mother agrees to marry Quinn so that she will be properly taken care of when the baby arrives. By chance, on the day of Quinn's execution he is notified that he is the rightful heir to the Walden dukedom. Need I say more? The premise of the story is intriguing on its own. But the unfolding of the story as Quinn and Jane, polar opposites, learn to make their unexpectedly real marriage work is absolutely brilliant. There's humor in this story that doesn't make the characters look or sound like simpletons. The interaction between the characters is what drew me in the most. Jane is pulled into Quinn's family of misfits and helps them navigate the rules of society. I loved the dash of mystery as Quinn tries to determine who was so keen to frame him. 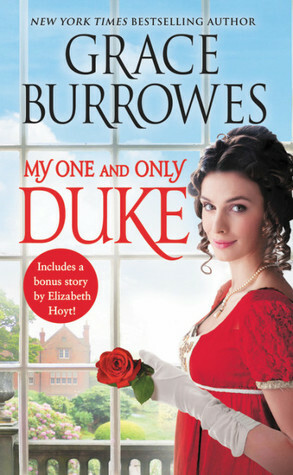 My One and Only Duke is everything you could ever want in historical romance! I could easily see myself reading this one two or three times before the next novel, When a Duchess Says I Do, is released. Grace Burrowes's new series is perfect for fans who love Paula Quinn or Jana MacGregor!